With this cost effective software you can bring state-of-the-art VoIP technology into your home and benefit from all the call management featured that used to be reserved for businesses. Axon is a virtual PBX system designed to help manage phone calls for large families under one roof or even help families that are all spread out stay in touch. Set up a pbx at home and give an extension to every family member for easy direct dialing. * License dependent, click here for more information on the different licenses. 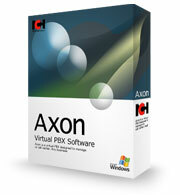 We have designed this home PBX software to be very easy and intuitive. Within minutes you can start making phone calls. The best way to see what this virtual pbx software can do is to give it a try, download now and take advantage of the free 14-day trial. For earlier versions please see Windows 98/ME and Windows 2000 respectively for legacy software. For testing, before you buy VoIP phones, we recommend you use our Express Talk Softphone. We recommend considering VoIP telephone numbers because they offer better quality, VoIP providers can provide cheaper home phone bills and VoIP doesn't require additional hardware since calls are routed over the internet. See a list of recommended SIP providers.